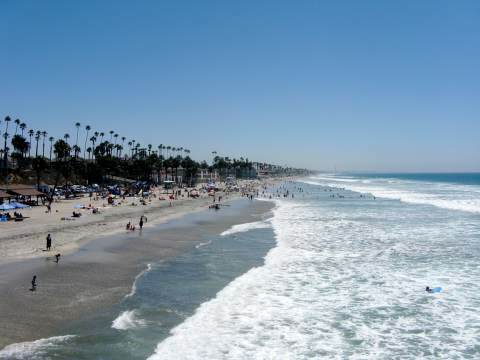 Visit Oceanside Beach, a popular Oceanside California beach just south of Camp Pendleton, with nice sandy beaches without the crowds of the San Diego beaches. 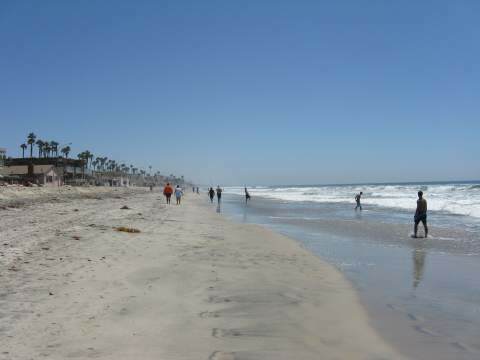 Oceanside Harbor, near The Jetties, is a popular surfing and fishing area at the north end. 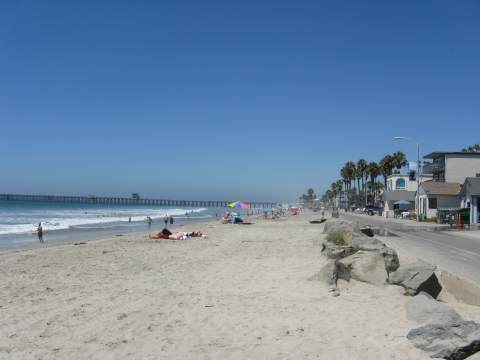 Oceanside City Beach, along The Strand, has a boardwalk, Oceanside pier and wide open sand, and is great for swimming and boogie boarding. Further south is Buccaneer Beach Park, another surfing spot. Location: Pacific Ocean at end of Mission Ave. Parking: Parking lots on Mission Ave. just a few blocks from the beach. Parking available on The Strand, which runs along the beach. Other small parking lots and street parking available. Bring quarters for meters or dollar bills for self-pay lots; some street parking is free. Getting There: Short walk to the beach from parking areas. There is a ramp at the Oceanside Pier. Things to Do: Walking, jogging, roller blading, sunbathing, fishing from pier, swimming, bodyboarding, beach volleyball, surfing, beach fires in firepits, picnic in nearby parks, visit California Surf Museum a few blocks away. Services: McDonalds and taco stand near the pier, vending machines, SeaBreeze cafe, surf shops, rental shops and hotels along the beach. High Tide Access: Good access to this wide beach. Lifeguard: Lifeguards during summer. For info. call 760-722-8000. Dog Rules: No dogs allowed on the beach or pier. Leashed dogs are allowed on The Strand. Disability Access: Some disabled parking and access near Oceanside Pier and along The Strand. Oceanside Beach Driving Directions - From Interstate 5, go west on Mission Ave. to the Pacific Ocean. I recommend that you park in a parking lot before you get to The Strand, as parking along The Strand is limited. Directions to Oceanside Beach by Train - You can easily reach Oceanside Beach from the San Diego Coaster Train. It is 4 blocks from the Oceanside Transit Center train station. Note: The Coaster trains have limited service on weekends and holidays, so check the current train schedule.